Cancer stem cells have been controversial but they may provide an important key in understanding why cancer can recur years after apparently successful initial treatment and point to the need for new treatment approaches. Obviously this is directly relevant to anyone with cancer, but for those who are well, are lurking cancer stem cells a concern? So this week, what are cancer stem cells? Where do they come from? What can we do about them? Did you know for instance, that turmeric is one of few things claimed to be able to destroy breast cancer stem cells and as such it make sense for anyone with breast cancer, or concerned about breast cancer, to consume it regularly. Given not so many people know about cancer stem cells, this may be a useful blog to share. There is a mystery in cancer medicine that is not spoken of much, probably because up until recently, no-one really knew the answer. The question is, how is it that cancer can be treated, all sign of it removed, and then years later it recurs? And how can we stop that happening. To understand we need to consider basic cancer theory. As most will know, cancer tends to begin in one location and then, if left unchecked, has a habit of spreading to other places. In the past, the classic way this spread was thought to happen was by cancer cells separating from the initial mass of cancer, and then by them gaining access either to the blood stream or lymphatics and travelling to other parts of the body to re-establish themselves there. This is why “follow-up” chemotherapy is often recommended after initial surgery – to “mop up” any stray or so-called “rogue cells”. Clearly, however, cancer can lie dormant for years after a first occurrence before appearing again as secondary cancer. How? Stem cells are precursor or basic cell types. Generally, stem cells are able to develop into many different cell types in the body. When a stem cell multiplies, the resulting cells either continue on as stem cells or, under the right conditions, they can develop into a particular type of cell – muscle, blood, brain, breast etc. There are two types of stem cells. Embryonic stem cells can make all the different types of cell in the body, while adult stem cells generally can only make the types of cells they directly relate to – so a muscle adult stem cell only leads to muscle cells. positively identified in 1998. Cancer stem cells share many characteristics with normal stem cells, including self-renewal and differentiation and while hotly debated for years, recent studies have shown that cancer stem cells do have the ability to regenerate new cancers. Just last month, a team from University of Oxford and the Karolinska Institutet in Sweden, claims to have proven conclusively that cancer stem cells exist. Why are cancer stem cells important? If cancer stem cells are as significant as thought, cancer could be eliminated by eliminating cancer stem cells. Targeting cancer stem cells would also mean any cancer cells left over from initial treatments could not sustain themselves. Dr. Woll, the lead author from the Oxford study says that while the findings are not sufficient to offer patients new treatments today, they do pave the way for developing more effective therapies that target specific stem cells to eliminate cancer. He also cautions that their study only looked at cancer stem cells in one type of cancer, and that the "identity, number and function of stem cells in other cancers are likely to differ from that." Reference: Woll P S, et al. Myelodysplastic Syndromes Are Propagated by Rare and Distinct Human Cancer Stem Cells In Vivo. Cancer Cell, DOI: 10.1016/j.ccr.2014.03.036, published online 15 May 2014. 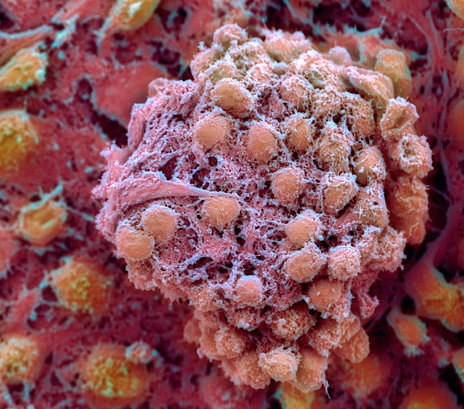 Unfortunately, it seems most cancer stem cells are resistant to current cancer treatments. More disturbingly, there is growing evidence that the classic treatments of chemotherapy and radiation actually increase the activity and aggressiveness of breast cancer stem cells – “enrichment” as it is called. It seems that while chemotherapy may reduce the size and volume of breast cancer, in doing so, it increases the cancer stem cell ratio, making whatever may be left even more malignant. Reference: Lagadec et al. Radiation-induced reprogramming of breast cancer cells. Stem Cells. 2012 May; 30(5):833-44. doi: 10.1002/stem.1058. What natural answers are available? At last some good news! Several herbs and vegetables have been shown in basic research to target breast cancer stem cells specifically. Curcumin (in turmeric) and piperine (in black pepper) separately, and in combination, inhibit breast stem cell self-renewal but do not cause toxicity to differentiated cells. Reference: Kakarala et al. Targeting breast stem cells with the cancer preventive compounds curcumin and piperine. Breast Cancer Res Treat 2010 Aug;122(3):777-85. doi: 10.1007/s10549-009-0612-x. Epub 2009 Nov 7. These vegetables contain high levels of sulforaphane that has been reported to inhibit pancreatic tumour-initiating cells and breast cancer stem cells. The reference here is a particularly good one for those who like the science! Reference: Li Y et al. Implications of cancer stem cell theory for cancer chemoprevention by natural dietary compounds. J Nutr Biochem. 2011 Sep;22(9):799-806. doi: 10.1016/j.jnutbio.2010.11.001. Epub 2011 Feb 4. Contains genistein which as well as significantly targeting breast cancer cells by promoting apoptosis or cancer cell death, also has been shown to inhibit breast cancer stem cells. Found in the skin of red grapes, dark chocolate and blueberries, reseveratrol significantly suppresses breast cancer stem cells. Reference: Pandey PR et al. 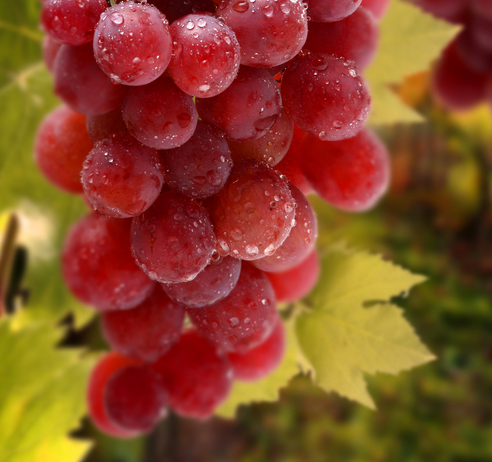 Resveratrol suppresses growth of cancer stem-like cells by inhibiting fatty acid synthase. Breast Cancer Res Treat. 2011 Nov;130(2):387-98. doi: 10.1007/s10549-010-1300-6. Epub 2010 Dec 29. Many questions remain to be answered about cancer. More studies are needed to determine precisely how different cancers grow and how they resist treatment. Do all tumours contain cancer stem cells? What genes, proteins or other molecules are involved in their development and behaviour? Does a cancer’s immediate surroundings, or ‘microenvironment’; do epigenetics affect how cancer stem cells behave? How can we be free of cancer stem cells? Do natural therapies offer real hope? The answers to these questions will shape future cancer treatment strategies. Come, join Ruth and myself along with like-minded people for 7 days of meditation in the extraordinary atmosphere of the Central Australian desert, followed by several days of close contact with senior local indigenous leaders. 2. Cancer and Beyond – Last minute opportunity! This is the 5 day follow up cancer residential program Ruth and I present at the Gawler Foundation’s Yarra Valley centre in just a couple of weeks. This program was fully booked 2 months ago, but some unfortunate last minute cancellations mean you may be able to attend. Call the Foundation on +61 3 59671730 or see the details on my website, CLICK HERE. 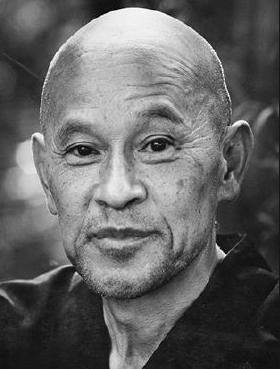 track if needed; but also exciting new information and the opportunity to meditate together and to deepen the experience of what meditation really is. 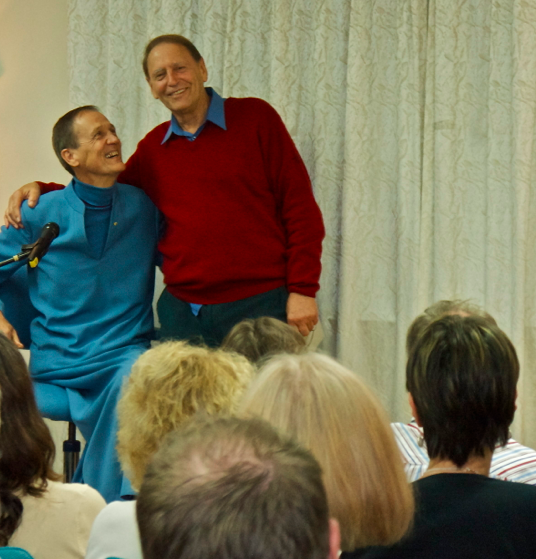 With Lionel Fifield at the Brisbane Relaxation Centre last year. Thanks for this report. One point to keep in mind is to be aware of the importance of either growing or buying food without the use of chemicals. 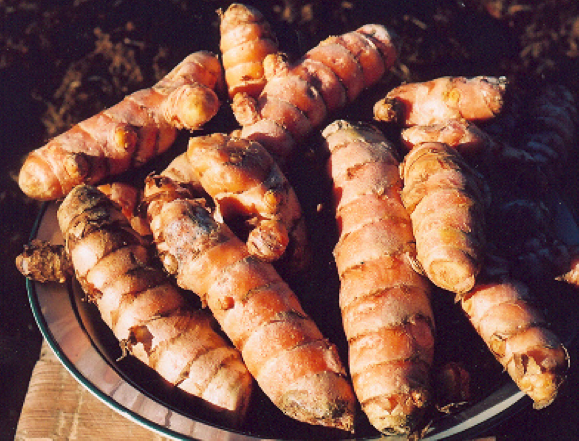 There are some great ways on YouTube to grow your own tumeric inside. This is a great blog and I know many many people will read it because everyone with cancer wants the answer to the questions about stem cells. well done and thank you. Thanks Ian, this is one of your most interesting blogs. I have heard about cancer stem cells but did not understand what they were or why they are so important. How amazing that the herbs and foods are so good at stopping them. How much of those things do we need to eat?